As discussed many a time on this blog, I am obsessed with skincare. 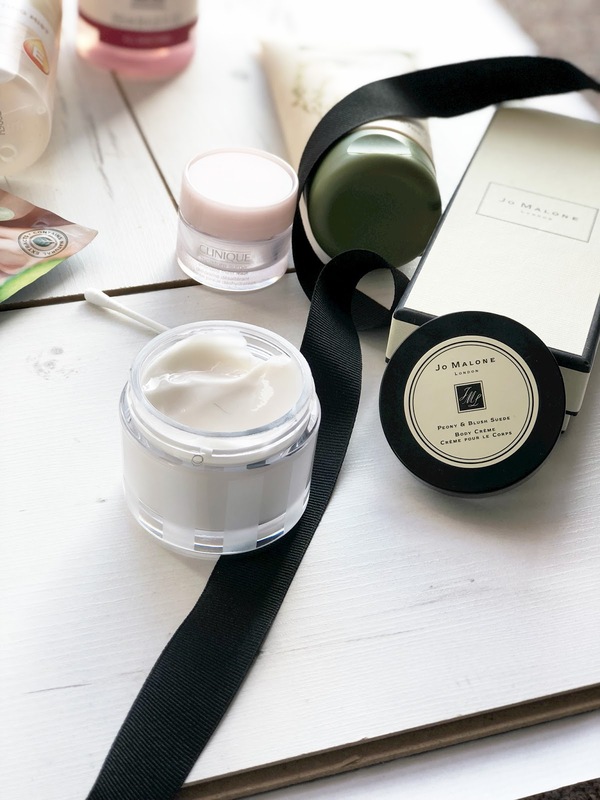 When it comes to skincare I am quite hesitant as my skin is very sensitive and breaks out from time to time (which I find highly annoying), so I'm always trying to find skincare products that are kind to sensitive skin and nearly natural. After using my everyday. go-to face wash I currently find myself toning my face with The Body Shop Vitamin E Hydrating Toner. Just a little bit on a cotton pad goes a long way, I apply this all to my face and my neck. One thing that I have realised is that my skin loves Vitamin E a LOT, so I'm always on the hunt for products with Vitamin E. The toner is alcohol-free so no harsh products are used in this product, I love the fact that it also takes off any excess makeup as well! It's not a blog post on ThatBelleMakeup without a comment on Clinique. I have used the Moisture Surge for a while, I'd say over the last 2-3 years and I need to just purchase a 100ml of the Clinique Moisture Surge. The moisturiser is a gel-like texture which immediately nourishes your skin whilst providing a subtle glow at the end of the application. The Moisture Surge is very lightweight on the skin and you can instantly feel a difference once applied. If I am not using the Clinique Moisture Surge, I am using my other holy grail product by Aveeno which is their Daily Moisturiser. I have been using Aveeno for over 5-6 years, no matter how many moisturisers I go through, I always find myself coming back to Aveeno. It's natural products like oats works so well with my skin and always leaves me feeling hydrated! It is the perfect remedy for the sensitive, dry and allergy prone skin as it is full of oatmeal which helps to restore the skin back to normal. I love the fact that it uses oats it cleanses the skin by removing the dirt but also treats skin with allergies providing a soothing sensation. On nights where I feel like my skin needs a little pick me up which is usually 1-2 times a week, I always put on a face mask. I have been using the Origins face mask for a couple of weeks as a sample size which I have been loving and need to add it to my wishlist. But when I haven't been using this face mask, I always find myself using the inexpensive Superdrug face masks for only 99p. 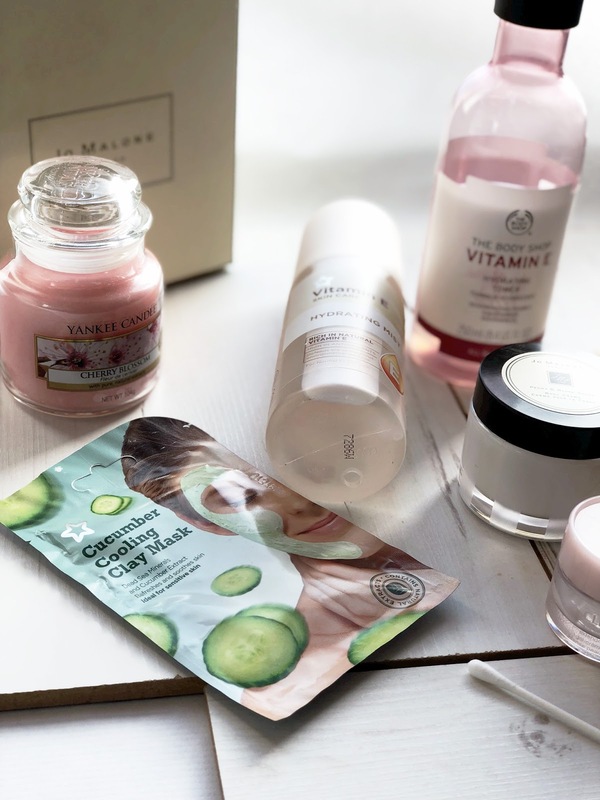 The face masks vary but I do love the Cucumber one as it doesn't break me out and leaves my skin feeling very fresh. To finish off my skincare routine, I always spray my face with the Vitamin E Toning Mist (another Vitamin E product, I know). I can't remember a year/day where I haven't sprayed my face after my skincare routine whether that is day or night, there's something soothing about using a face mist. It calms my skin and my mind, ultimately. I love the finish it provides on my skin as well as the fact that it helps to tone my face - after using it for a good 3 years this mist has changed my skin tone by evening out my complexion. I love it!